I am delighted that you have stopped by! Today is the day Martha and I celebrate and show off our tea cups. If you have a love of tea cups too, and some to show off, please join us by signing up below. Today my cup is simple, but elegant....in my humble opinion. I do love the corset shaped cup. I also absolutely love this shade of blue/green. It looks quite plain in the photo, it was a stormy day when I took the pictures. But this cup is not plain at all. The flowers inside really liven it up. 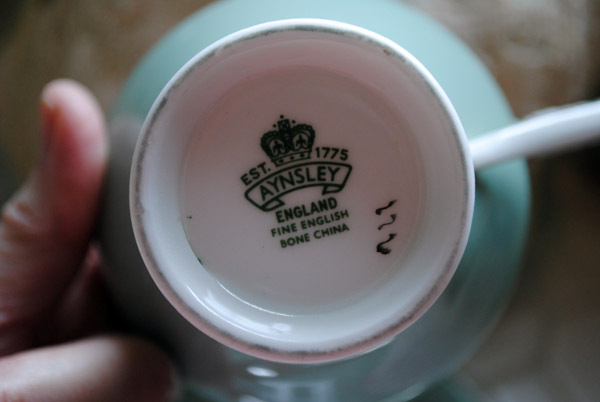 As you can see by the backstamp, it was made in England by Aynsley, this company often created the corset shaped cup. The hand written number (?) in black could signify the artist of the cup. John Anysley started his company in 1788 because he loved to collect china. His son tried to follow in his father's work, but was not able to run the company well. Mr. Aynsley's grandson began to work at the company at age 9, sometimes working 16 hour days to learn the business. He did much better than his older brother, and the company did very well. Below is the end result of my crazy idea to create a tea cozy from vintage laces, buttons, ribbons and a huge rhinestone button. I actually do love how it turned out, very eclectic. Also below are the Christmas trees that I bleached. I love all the different colors. 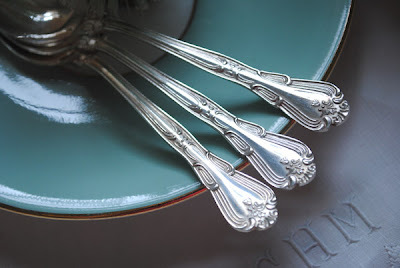 Below are three of my new vintage tea spoons, these are tiny spoons used in tea cups. They are smaller than a traditional teaspoon here in the US. I am so glad you could come. I hope that you all had a lovely Thanksgiving (those of you from the US). It is almost December!!! One more day and then it is countdown to Christmas. Remember to stop by and visit dear Martha! That cup is absolutely gorgeous!! I just the love the color and design! Definitely elegant! The Tea Cosy is just divine! hoping you'll love the Celtic Christmas music i've posted :) perfect for taking timeout for tea! Your cup is lovely, I especially love the color. And your tea cozy is absolutely gorgeous. Did you spray the trees with bleach? That is such a cool idea to bleach the trees. TFS. Happy Holidays. I very much like the teacup you have shown, and the simplicity of it belies the elegance.The color is beautiful and the flowers are so richly painted.Yo are right, the cup is not plain at all. O I should show my collection of old dutch teaspoons! The cup is wonderful and I love the teapotcosy. Lovely!! I´ve joined to your Tea Cup Thursday Party few weeks ago. Princesa Nadie show me your place. I have no so beautiful tea cups and photos but I love tea and your party, so, here I am. Today I have my tea in Wonderland, all of you are welcome. Your Aynsley tea cup is beautiful. I really like the corset shape and that gorgeous blue color. Your tea cozy is lovely too- very elegant looking. I love your teacup Terri! It's such a pretty blue and I love the roses inside! And I LOVE your tea cozy! Beautiful!! 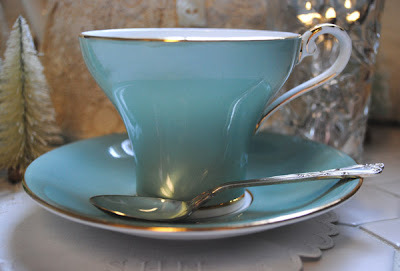 The tea cup is pretty, the color reminding me of the 1950 popular aquas and pinks. The tea cozy is just darling!I am impressed with your creative idea. I have knitted a couple, but favor using the quilted ones. 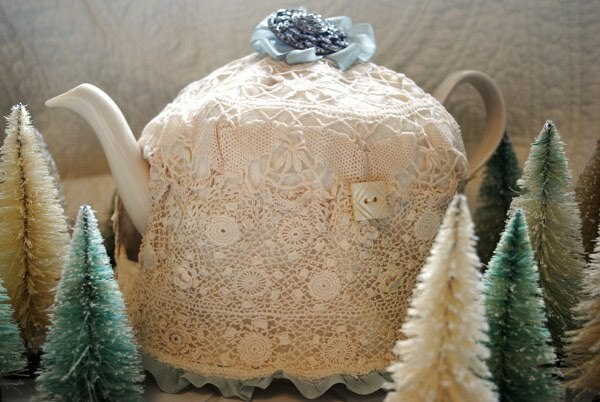 However, yours is so pretty and would be such a nice visual at a Victorian themed tea! Lovely! My daughter's favorite color is aqua and I can just picture her with this amazing cup and saucer. Hi Terri! Your tea cup is lovely. I love the color, the shape and the pretty flowers inside. Your idea for a tea cozy is brilliant ~ so pretty and I really like the Christmas trees too. Thank you for stopping by our garden teaparty...I realized my mistake as soon as I made it with linking to last weeks party. I love your teacup and the tea cozy is adorable...I do like how your trees turned out also. I am currently on the look out for some small teaspoons...I am thinking our next trip to Micanopy will be the best time to find them. 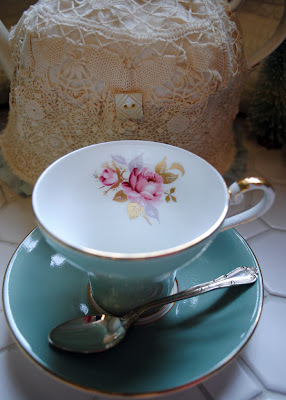 Your tea cup is beautiful, (I LOVE the color), and the tea cozy is just gorgeous! Beautiful cup and saucer Terri, so reminiscent of a stormy sky over the rose garden! Oh my goodness!! The teacup is totally gorgeous...I love the surprise of roses on the inside. And the cozy!!!!!!!! my heart skipped a happy little beat when I saw it. I am in love with it, my friend..total love. thank you for sharing. I just love your teacup as it is one of my favourite colours! Aqua has been a colour I swoon over for as long as I can remember! How lovely it is with the bouquet of posies inside the cup itself; love it! And I'm crazy for your lacey tea cozy! Very feminine; just the way I like them! Enjoyed your tea post very much; thank you for sharing. I love this shade of blue! Such a pretty cup. Aynsley made so many beautiful wares. I have a lampshade with this blue color and pink roses...it would look so pretty paired with your cup and saucer. The tea cozy is just exquisite! Pretty vintage spoons too! Its the perfect cup!! 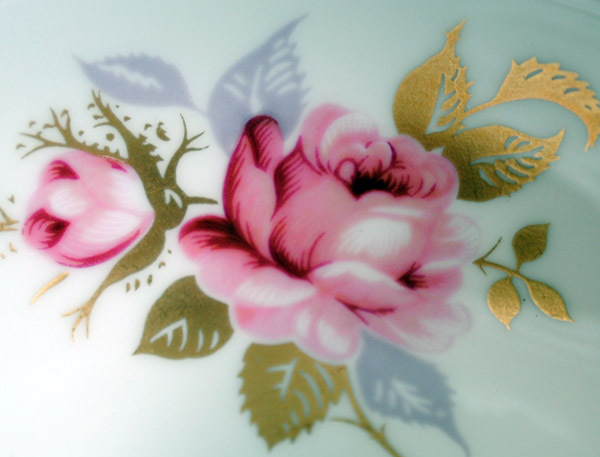 Colour, shape and little rose, matches your blog to a tea. Sorry I am so late, but couldn't miss it. Oooo...I LOVE teh Aynsley teacup. Such a lovely color, and the profile of the teacup is very elegant and streamlined. Not too frilly, just right! I so love your tea cozy. It's so pretty Terri, as is your teacup. 'Course I haven't seen one yet, that you've shared, that hasn't been simply lovely. What a lovely teacup and saucer. The color is gorgeous and as I love roses, the flowers inside are just the perfect accompanyment. I don't think I have ever seen a cup in this shape before. The tea cozy is wonderful! 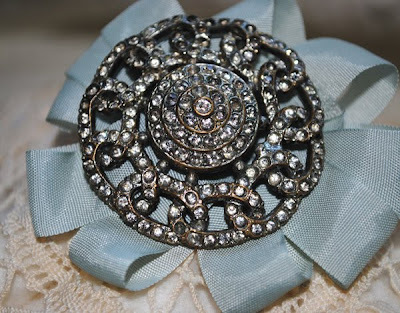 How my Bleuette dolls would love that vintage lace. Now, would you tell us how you bleached the trees? Your tea cup is a wonderful color - bright and vivid; and the floral painting on it is delightful! You did an amazing job with the tea cozy; very vintage, very warm, very pretty. Love your tea cosy and cup, Terri! Merry Christmas to you and your family!